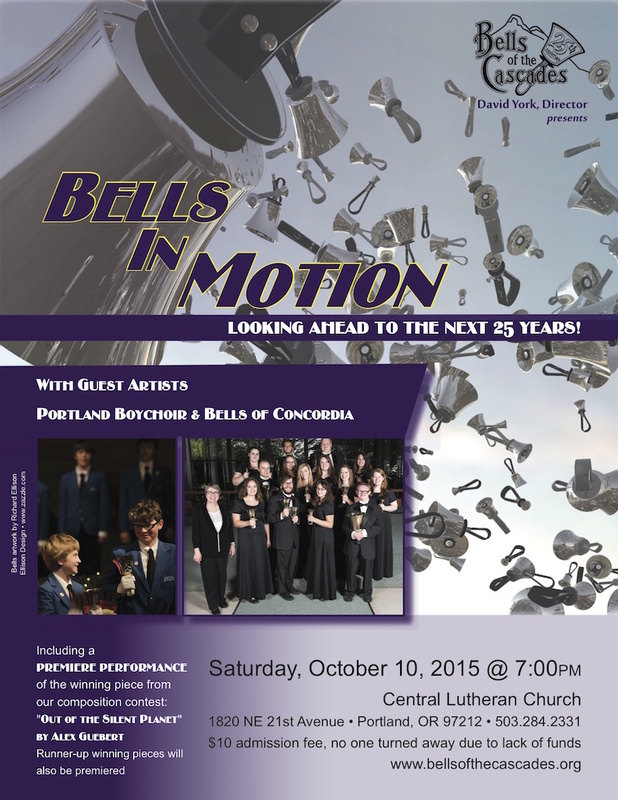 Fall concert: Bells in Motion - Looking ahead to the next 25 years! 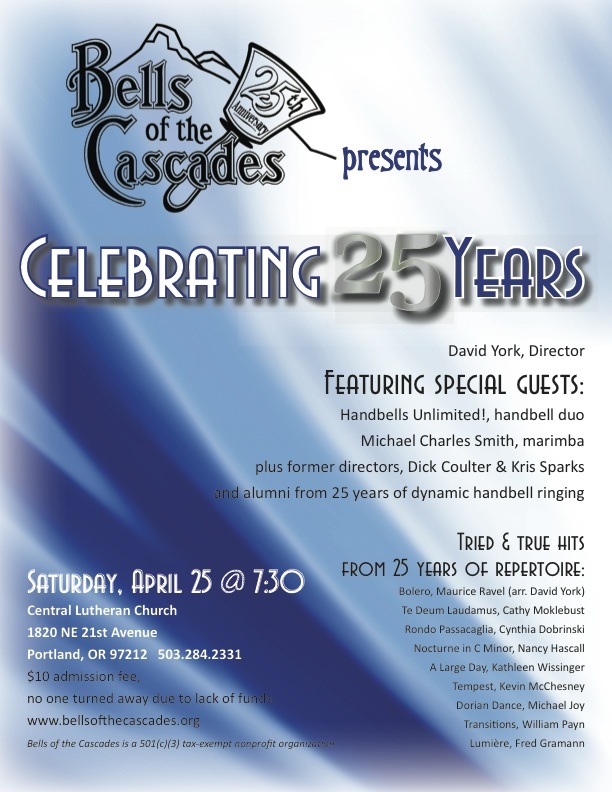 Join us for our second concert celebrating Bells of the Cascades’ 25th anniversary! Featuring Bells of Concordia and Portland Boychoir, as well as a premiere performance of the winning piece from our composition contest: “Out of the Silent Planet,” by Alex Guebert. Pieces from runners up will also be premiered. Read more about Fall concert: Bells in Motion - Looking ahead to the next 25 years! Bells of the Cascades announces its third full-length CD: Hitting Things! Continuing the celebration of its 25th year, Bells of the Cascades — building on the premise that handbells are a tuned percussion instrument — has created its third-full length CD, Hitting Things! The songs on Hitting Things! pair bells with a variety of other percussive instruments and sounds from traditional drums to less traditional, and somewhat improvised, sounds. Teaming with Michael Charles Smith (“Marimba Mike”), Bells of the Cascades ends the CD with a spell-binding arrangement of “Bolero” for marimba and handbells arranged for Bells of the Cascades by its director, David York. Hitting Things! can be purchased for $15 directly from Bells of the Cascades via PayPal, or at CDBaby. View more information and the track list for Hitting Things! 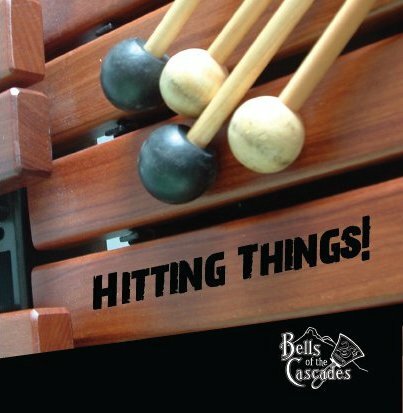 Read more about Bells of the Cascades announces its third full-length CD: Hitting Things! Bells of the Cascades will premier the winning compositions at its concert in October — mark your calendar now! Once again, we were very pleased with the quality and creativity with all the handbell compositions we received. Thank you! 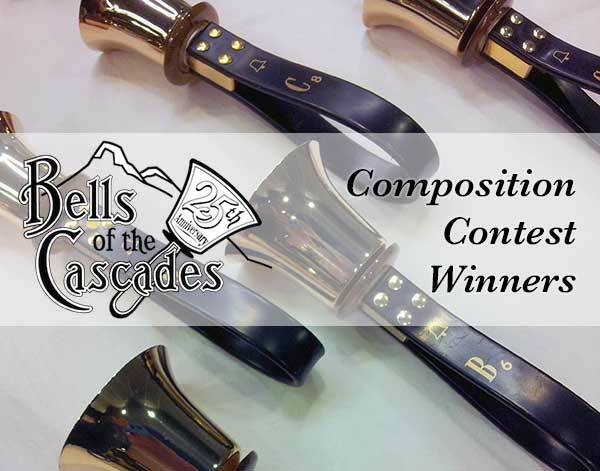 Bells of the Cascades is pleased to announce the five finalists in its 25th Anniversary Composition Contest. The finalists were selected from 21 entries. The winner of the competition will be announced on April 25 at Bells of the Cascades’ 25th Anniversary Celebration Concert in Portland, Oregon. Thank you to everyone who submitted entries. We were very pleased with the quality and creativity of the submissions! Join us for a concert 25 years in the making! Friends new and old, we hope you’ll join us for our 25th Anniversary Concert on Saturday, April 25 at 7:30 PM at Central Lutheran Church in Portland. View the complete event information, or join the Facebook event and invite your friends. This will be an event you don’t want to miss! Read more about Join us for a concert 25 years in the making!